FREETALK® Everyman USB Headset for Skype: Not "Just Another Headset"! 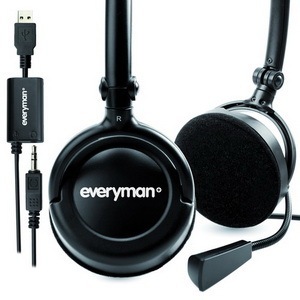 FREETALK® Everyman USB Headset for Skype: Not “Just Another Headset”! Skype’s research has found that a Skype user’s “end point” configuration is one of the main contributors to churn. A major component of the end user configuration is the PC’s audio chip; they have found evidence pointing to a lack of consistent audio quality across the various PC audio chip sets. The recent introduction of Skype’s “superwideband” SILK audio codec, supporting a 12KHz audio bandwidth, has set new bars for incorporating HD Voice performance into a headset – both the speakers and the mic. Complementary to the PC has been the widespread adoption of (smartphone) media players such as iPod, iPhone and BlackBerry; standard earbuds are not capable of adequate overall audio quality, especially for bass tones. Cost: try to find a good quality headset for under $30 or $40. A “no brainer” impulse purchase is certainly assisted by keeping the cost low. Finally, in this age of online e-commerce, why do the devices that are shipped as a result of an online purchase need plastic clamshell packaging that goes straight to landfill (and generates emergency room visits when cutting the packaging open)? The sale has been completed; there’s no need for the packaging to be a “sell piece”. Since late 2007 In Store Solutions’ wireless stereo headset has been a top seller on the Skype store. It has been my PC headset of choice ever since I received one in December 2007. When Skype recognized the need for a headset that provided both consistent audio quality across all PC models (desktop and laptop) while also fully supporting the audio bandwidth demands of their SILK codec, they approached In Store Solutions about producing a new basic headset that addressed Skype’s audio quality concerns. But with In Store Solutions’ previous retail distribution and audio hardware experience they designed a product that also addressed the other issues outlined above. The result of this partnership was the recently launched FREETALK Everyman Headset. It’s a USB headset incorporating an audio chip in the USB dongle. But on the headset side the USB dongle has a 3.5 mm speaker jack into which is plugged the removable speaker wire coming from the headset. Compatible with both Windows 2000® / XP® / Vista™ and Mac OS 10.22 or later, the only other requirement is a USB port on the PC. HD Voice support within the audio chip via its support for the SILK codec used in Skype for Windows 4.1 and Skype for Mac 2.8 (or later) and an overall 20Hz to 20KHz audio bandwidth. A flat fold-down design that compresses the entire headset to a thickness less than 3 cm or 1.25 inches; it readily fits into your PC carrying case. A removable speaker plug such that, when not using the headset with your PC, you can plug the speaker plug into any media player with a 3.5 mm audio jack, such as the iPod, iPhone (3G and 3G S) and BlackBerry. Eco-friendly “brown box” recycled cardboard packaging that not only eliminates sending plastic clamshells to landfill but also helps to reduce shipping costs. And, to encourage “no-brainer” adoption, it’s available at the Skype Store at US$22.88/£19.88/€19.88 – including delivery (and VAT in Europe). I made some test Skype calls and the audio quality was excellent. I also connected my iPhone using the 3.5mm jack and was able to play music using the iPod application on the iPhone. Slightly better bass response than my iPhone ear buds due to the larger speakers. All in all, a pretty good Skype headset. Hints (based on some initial user feedback): when you receive your FREETALK Everyman headset, ensure you plug the speaker plug into the speaker jack on the USB dongle for listening to your Skype calls or any multimedia playback from the PC. And to keep the cost down the volume control is carried out via the volume control slider in the Skype clients. Bottom Line: Addressing the audio quality issue is only one aspect of the Skype user’s end point configuration that can affect the overall Skype call quality. The PC processor, active software programs, operating system (Windows or Mac) and user’s Internet connection can also contribute to the finalSkype call experience. However, the FREETALK Everyman headset optimizes the audio configuration of the PC and its associated audio hardware such that it consistently meet the standards required to support Skype’s SILK codec and its contribution to the overall calling experience. At his talk to VON Canada in April 2006, Skype Goal: “Better than a phone”, Stefan Oberg outlined many user issues that Skype still needed to address at that time. During that talk Stefan mentioned Skype’s frustration with the fact “terrible user experience” when the user could not readily locate the audio jacks on the rear of (older) PC’s. In April 2007 Skype 3.2 was launched incorporating echo cancellation – which allowed users to use their basic PC mic and speaker for Skype calls without having to deal with echo feedback from the speakers back into the microphone. 18 Responses to FREETALK® Everyman USB Headset for Skype: Not “Just Another Headset”! Thanks to Jim, we've had the opportunity to try a couple of the Freetalk headsets out, and have found them to have a very high audio and voice quality over Skype! They work very well with our Skype Call Center software.